BQ-CC75-AA2000‏ : VALUE PACKAGE - Smart Charger & 4 x AA 2000mAh eneloop READY-TO-USE rechargeable NiMH batteries. NEW IMPROVED CHARGER MODEL !! Battery cells arrive pre-charged, and they RETAIN THEIR CHARGE when not in use. The BQ-CC75 wall charger has flip-out prongs on back, and plugs right into wall outlet (worldwide 100-240VAC input). It has 4 separate charging channels - each cell is charged individually. Each channel has an LED charge status light. Fully re-charges AA batteries in under 4 hours; has automatic peak detect function - each channel stops charging when the battery in that channel reaches full charge. Charger also has a built-in USB2.0 1A charging port; you can charge your smartphones & other mobile devices from this port ! BK-3HCCA : eneloop AA battery cells. 1.2 volt 2550mAh NiMH, PRE-CHARGED and READY TO USE. 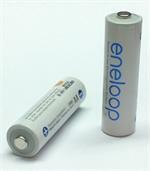 BK-3HCCA : ENELOOP PRO rechargeable NiMH AA battery cells. PRE-CHARGED & READY TO USE. They retain their charge when not in use for up to 1 year! Available in ANY QUANTITY. Choose Plain (button top), or with Solder Tabs. 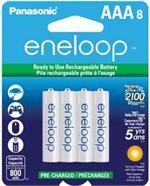 BK-4MCCA4BA : 4-Pack of ENELOOP rechargeable Ni-MH AAA cells. Arrive to you PRE-CHARGED and READY TO USE ! Long-life, premium-quality AAA batteries; 800mAh capacity rating. 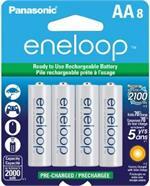 BK-3MCCA4BA-4AA : 4-Pack of ENELOOP AA 1.2volt 2000mAh rechargeable Ni-MH batteries. PRE-CHARGED and READY TO USE ! 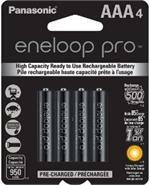 BK-4HCCA4BA : 4-Pack of ENELOOP PRO AAA 950mAh NiMH cells, PRE-CHARGED & READY TO USE ! BQ-CC75: Smart Charger for AA & AAA NiMH batteries. Upgraded & improved! 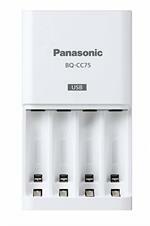 BQ-CC75: Panasonic Smart Charger for NiMH AA and AAA cells. NEW IMPROVED MODEL. Plugs into wall; charges 1,2,3, or 4 batteries at a time. WORLDWIDE AC input(100-240VAC). Has flip-out prongs on back; plugs right into wall outlet. Has USB2.0 charge port. 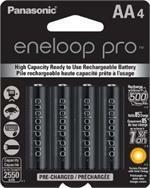 BK-3HCCA4BA : 4-pack of ENELOOP PRO AA NiMH 1.2 volt 2550mAh rechargeable batteries. PRE-CHARGED & READY TO USE ! They RETAIN THEIR CHARGE when not in use for up to a year ! ! Package deal: V-1000 Smart Charger kit & 4 x AA ENELOOP Ni-MH cells 2000mAh. Package Deal: V-1000 smart charger with 4xAA 2000mAh ENELOOP NiMH cells. Cells are CHARGED & READY TO USE. Package Deal: V-1000 smart charger with 4xAA size 2000mAh eneloop PRE-CHARGED NiMH batteries. Package price $ 23.95. Versatile smart charger and Long-lasting eneloop rechargeable batteries ! 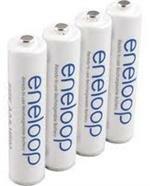 BK-4MCCA8BA : 8-Pack of ENELOOP AAA Ni-MH cells, 800mAh. PRE-CHARGED. 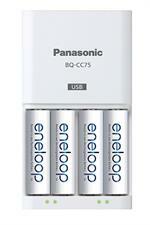 BK-4MCCA8BA : 8-Pack of ENELOOP AAA Ni-MH cells, 800mAh. PRE-CHARGED & READY TO USE. They RETAIN THEIR CHARGE when not in use - up to 70% of full charge after 5 years! 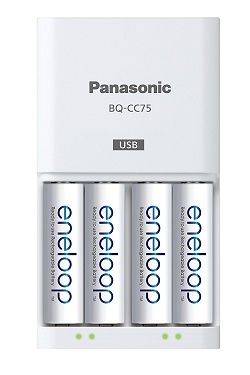 BQ-CC75-AA: Panasonic Smart Charger + 4xAAA eneloop 2000mAH cells. Upgrades and replaces # BC-MQN10A-AA. The BQ-CC17 can charge 1, 2, 3 or 4 cells at a time. BQ-CC75-AAA: Smart Charger + 4xAAA eneloop 800mAH NiMH cells. NEW IMPROVED CHARGER MODEL. Charges 1, 2, 3 or 4 cells at a time. Cells are PRE-CHARGED & READY TO USE. Charger also has built-in USB2.0 1A charge port. V-6280 : FAST Smart Charger for up 1 thru 8 AA or AAA NiMH or NiCd batteries. V-6280 : Smart Charger system for AA & AAA NiMH & NiCd batteries. Charges each cell individually; the V-6280 has 8 separate smart-charging channels. It can charge 1 thru 8 cells at a time. Includes wall Power Supply AND 12VDC vehicle Power Cord. BK-3HCCA8BA : 8-Pack of ENELOOP PRO AA NiMH batteries. Capacity rating up to 2550mAh. These arrive to you PRE-CHARGED & READY TO USE !